Schlock Treatment: Sunday 25th July 2010: The Dybbuk! Sunday 25th July 2010: The Dybbuk! 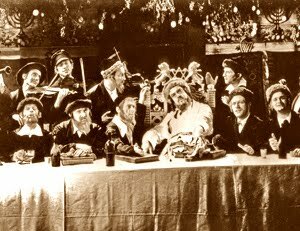 We've screened some obscure films in our time, but never a Jewish horror film. 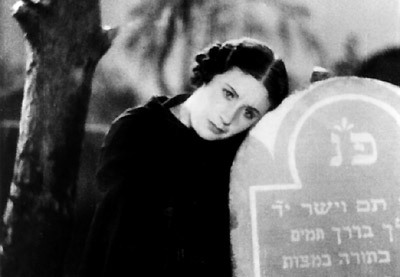 Tonight we right that terrible wrong by unearthing a 1937 version of The Exorcist, filmed in Poland and entirely in Yiddish. Intrigued? Then let me introduce you to The Dybbuk. 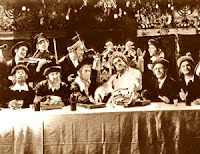 The film was an adaptation of an extremely popular Yiddish play first performed in 1914, and based on the Hassidic Jewish folk tales of Eastern Europe. One such age-old legend – and if you've seen the start of the Coen Brothers' A Serious Man, you'll know what I'm talking about – is that of the Dybbuk, a malevolent earth-bound spirit that possesses a living person, or the body of the recently deceased. The exteriors was shot in 1937 in a picturesque and primarily Jewish village in Poland called Kazimierz, untouched by time and insulated from the swelling tide of anti-Semetism – there's even an actual cemetary, which the film puts to good use - and the filmed version varies very little from the original text. Two old friends promise that their future children, if boy and girl, will marry each other. Years later, one of the fathers inadvertently betroths his daughter to a wealthier suitor and yet the offspring, as fate would have it, meet and fall in love. The boy Chanan makes a pact with demonic forces to allow him to marry Lea, but he dies in tragic circumstances under the watchful gaze of otherworldly figure The Messenger, and Chanan's restless spirit demands that the bride and groom be united, even in death. The Dybbuk works on many levels – as a faithful rendition of 19th Century shtetl life, as a surviving fragment of a pre-war Yiddish film culture, and as a stark, atmospheric and at times disturbing supernatural tale, echoing the European Expressionist horrors of the Teens and Twenties. There's a further layer that one must never forget and that's the film's own tragic history. 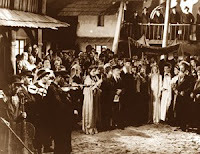 The tiny village of Kazimierz in eastern Poland was officially declared “free of Jews” in 1942; actor Ajzyk Samberg was destined to die in a concentration camp in 1943, along with many of the film's extras, and cantor Chazzan Gershon Sirota would never make it outside the Warsaw Ghetto. 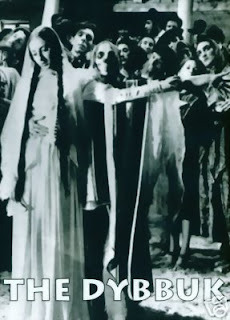 Lest the film appear completely cursed, the story of The Dybbuk's two romantic leads, Leon Liebgold and Lili Liliana, had a much happier ending after they escaped Poland for America and later married. In the actual film, however, they're doomed, and after an elaborate and quite harrowing Jewish exorcism sequence, the ending is both poetic and devastating. 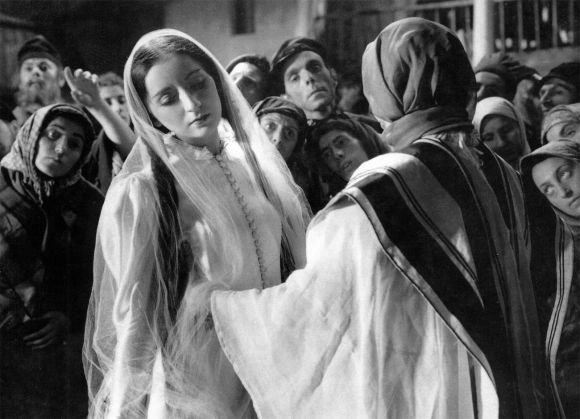 I realize it's not our usual Schlock Treatment fare, and at two hours some of you will find it slightly lethargic, but please stick with it – I swear you have never seen anything like the 1937 Yiddish horror film The Dybbuk. Just watched it thanks to Netflix. A wonderful film with lot's to offer in terms of plot twists.